From an young age, Sophie has always had a distinctive eye for fashion and design. Taught to design and sew by her mother, Sophie developed an interest in fashion early on. She went to school to study fashion, and earned her Bachelor’s in Fashion Merchandising. Eager to further immerse herself in the fashion industry, Sophie moved to New York City to gain experience and inspiration. There, she worked as a trend consultant, personal stylist, and as a freelance designer. Sophie has worked as a fashion editor for various magazines, volunteers as a personal stylist for the non-profit organization Dress for Success, and specializes in fashion & interior design. She started this website to highlight her favorite styles & designers, unique street fashion & inspiration, and everything in between. Sophie currently does wardrobe & interior styling and design work through her company, Bederatzi, LLC. 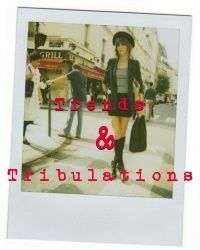 Thanks for checking out Trends & Tribulations!